One of the highlights of London is the Tower of London. We booked the Walk On Walk-off Tour that included admission to the Tower of London. Today’s plan was to take the tour and spend 3-4 hours visiting the tower. We hoped to fit in a visit with a friend who was in London at the same time. Then take the tube to Camden Town and visit the Market. The meet-up spot for the tour was a quick 5-10 minute walk from our hotel and Jeremy was our guide again. We started with visiting Hays Galleria. Originally a brewhouse it was converted to a wharf in the 1700s and then into an enclosed dock. At one point 80% of dried produce imported into London passed through here. You will find offices, restaurants and shops there now. It is worth a stop if you are in the area. We followed the Thames Path passing London City Hall and the Shard to Tower bridge. Tower Bridge is relatively new, built in the late 1800s. It is both a bascule, (draw-bridge), and a suspension bridge. Jeremy previously worked a guide at Tower Bridge, he told us a story about a double-decker bus that began crossing the bridge when the bridge began to rise and open. The bus driver accelerated the bus and jumped the 3-foot gap landing 6 feet below on the north side of the bridge. That would have been an exciting commute! On the way to the Tower of London we stopped at St Katherines Docks, The area takes its name from a hospital that stood on the site, built in the 12th century. The Tower of London founded in 1066 by William the Conqueror. The main building the White Tower has stood on this site since 1078. It is perhaps best known for its prison and Royal executions. Jeremy brought us into the Tower of London grounds and showed us where to wait for the next Yeoman Warders, (Beefeaters) tour. There are Currently 38 Yeoman Waders, including the Chief Warder, and are retired members of the Commonwealth Armed Forces. They have residences within the tower and are very knowledgeable about the history of the Tower. Make sure you take the time to go on the tour with them it is very informative and entertaining. After the Yeoman Warders tour, it was time to get some lunch. Definitely check out the cafeterias in any of the historic places or the museums. The food is very good maybe a bit pricey, but very convenient. We ordered the barbecued chicken and roasted potatoes followed by strawberry tart. The White Tower is one of the most famous castles in the world and home to the Royal Armouries. Travelling in September helps with the crowds, we didn’t have to wait to see any of the exhibits. As well as a royal residence, armoury, and prison the Tower of London also had a zoo. The Royal Menagerie wild animals given to the Royals were kept within the walls of the compound as early as the 1100s. A polar bear was among the animals kept. It was chained by the leg but able to swim in the Thames to fish for food. 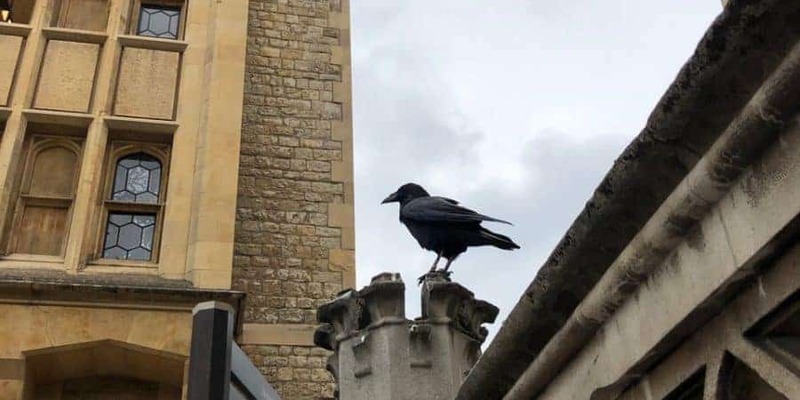 No animals other than the Ravens reside here now. The Tower is well known for its bloody past. Including the execution of three Queens, and the murder of two young princes. The Tower of London is immense and took far more than 3-4 hours to visit, finally finishing our visit around 5 pm. It was too late to visit Camden Market. Instead, we walked back to our hotel, stopping at a grocery store. We picked up some ready-made food for dinner. It was good and cheap. I recommend the books Wolf Hall and Bringing up the Bodies if you enjoy historical fiction and want to visit the Tower of London. At the hotel, we checked tours that were being offered by London Walks. The walk we picked, met outside the Bank tube station. If you can avoid the Bank tube station I highly recommend doing so. It was a claustrophobic maze of tunnels that went on forever. Not to mention we seemed to be heading upstream from everyone else in the station. The rain started not long after the tour began and Georgia did not find it interesting. About 15 minutes into the tour there was a stop at a wine bar that she was unable to go into. We let the guide know that we decided to leave the tour and walk back to the Hotel. The rain had let up at that point and we had a nice walk back enjoying the sights along the way. We passed the monument to the great fire and crossed London Bridge at twilight. Our plans for the next day was a visit to the Westminster Abbey and a tour of Westminster and Parliament Square. If you enjoyed this post and wanted to read more about our trip I have posted about our planning, travelling to London, our first day in London, visiting the Borough Market and our visit to the British Museum and Tour for Muggles. As well as stateroom tours of our secret porthole rooms 6006 and 5520.